The 300 striking nurses are stationed at the Mathari Mental Hospital, the National Spinal Injury Referral Hospital, the national blood bank and the Jomo Kenyatta International Airport's port health department. 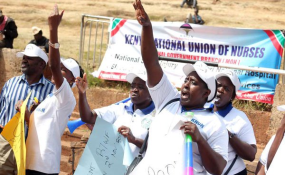 Operations at the Kenyatta National Hospital, the country's largest referral facility, are however unaffected since its nurses belong to the Kenyan Union of Domestic, Hotels, Educational Institutions, Hospital and Allied Workers (Kudheiha). Branch secretary Maurine Nzioka said the meeting's proceedings had been "fruitful" and "shown signs of good progress", but insisted that nurses would remain on strike until their demands were met. "We will not go back to work until we receive the written commitment from the national government to implement the return-to-work agreement signed on November 2, 2017," the union official said. Allied to Knun's city branch of nurses employed by the ministry, the nurses joined the nationwide strike that began in 24 counties last week. Carrying placards and chanting slogans, they staged a peaceful demonstration in the central business district to protest the ministry's failure to implement the deal it signed with Knun and the Council of Governors on November 2, 2017. "We are yet to receive the nursing service allowance of Sh3,000 per month and the uniform allowance of Sh5,000 per year as indicated in the agreement," she said. "We are also puzzled by the failure of our employer to promote any of our members since 2009. This is not fair to the nurses, who have stagnated in the same cadres for a decade," she said. On Thursday, the nurse's counterparts employed by the Nairobi government suspended their strike after the county agreed to pay the allowances. "The allowances were paid and we are currently on duty as the county government organises for our promotions on merit," said Knun's Nairobi branch secretary Ediah Muruli.